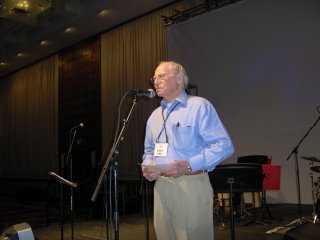 Dr. Lester Pifer, now on the staff of the Columbus, Ohio, Grace Brethren Church as Seniors Pastor, gave testimony in the opening session of Celebrate06 of God’s provision and blessings since his conversion to Christ in 1940. Beginning as a church-planter at “Hairpin Curve Chapel” in Tennessee while in college, Dr. Pifer went on to pastor churches in South Bend, IN, and in Fremont, OH, and then served 33 years with the Brethren Home Missions Council, assisting or directing in the planting of more than 200 Grace Brethren churches. Since his official retirement in 1985, he has also served 12 years in Florida as a church planter and now shepherds a seniors group of more than 1,000 in the Columbus area. Now in his 66th year of ministry, Dr. Pifer gave testimony that, “God has supplied all our needs and the power we have needed” for that long ministry.